Are you interested in sharing your thoughts about some of the toughest issues facing our country—as well as listening to the opinions of your neighbors and friends? 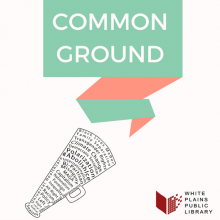 Then join us for Common Ground, a series of community conversations hosted by the Library and the League of Women Voters of White Plains. People of all viewpoints are welcome to participate, and we are committed to creating an atmosphere that is safe for everyone who attends. It will be a place to share experiences, opinions, and solutions to understand how people in our area are actually affected by the policies, issues, and events that we hear about in the news and media. We believe that together, we can reach across what divides us to create Common Ground. We will use the World Café model to structure our conversation. Participants will be split up into small groups and paired with a table captain, who will help keep the discussion on track. We will mix the groups up a few times during each event, to maximize the number of people who interact with each other. There will be time for both dialogue and reflection. Meetings will be held on the third Thursday of every month, from 6:00-8:00 p.m. Our next discussion, on May 16, will be about Healthcare. To see the full list of dates, pick up a copy of the Common Ground brochure, or view the PDF here. Because knowledge and critical thinking are essentials for all people in a democratic society, the League and the Library believe in supporting civil discourse and fostering an informed public. One of the major goals of the League of Women Voters is to support civil discourse to strengthen democracy and promote an informed and engaged electorate. The library is a place where all people are welcomed, to provide opportunities for education, and to create community. In that spirit, the League and the Library invite you to join us to create Common Ground. Hi Diana, feel free to come to the event a little later. Unfortunately since we close at 9:00 p.m., we need to allow enough time after the event for any continuing conversations and so staff can clear the room. Morning – can we assume that the next meeting will be the 18th of October? At the moment I am traveling for business on Sept 20 and may not be able to attend, but I wanted to plan forward? Yes, the October meeting will be on 10/18, and will focus on the topic of civic engagement & voting. Bi- Lingual, attended Mercy College, was a trade show manager, etc and a senior.,I have benefited from classes at the libraries and at various community opertunities. I beleive I have lot to share and can help . Great! Definitely plan on joining us then. No registration is necessary, but if you have any questions, feel free to email our Local History Librarian, Ben Himmelfarb at bhimmelfarb@whiteplainslibrary.org He’s organizing the meetings with the League of Women Voters of White Plains.